This week’s card is called Heart With Roses and was made by Pam Zimmerman. 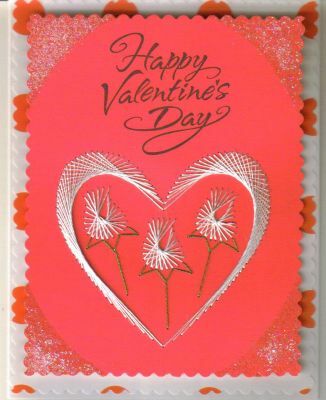 This stylish card was made using the Form-A-Lines Heart and Roses Pattern. Pam Zimmerman said: “DMC rayon white thread was used. I glittered the edges and used sticky pads to bring out the pattern. I added a polka a dot background. The inside says “Roses are red… Violets are blue… Here’s a Special Valentine wish for you”.